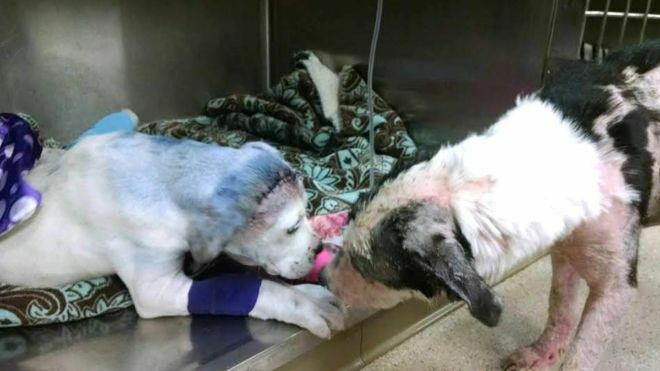 Sammie, a young puppy, came into a South Carolina veterinary clinic with horrifying injuries. The boxer had been spray painted, shot in the head, and drug behind a car. His injuries were extensive and serious, including at least one broken leg. When he arrived at the clinic his injuries were at least 2 days old, according to You Caring. Despite the horrific circumstances that brought Sammie to the hospital, there was a ray of hope. Sammie was laid on an X-ray table shortly after his admittance to the animal hospital. Simon, a one-year-old Border collie mix, another patient at the hospital, was let out of his kennel to stretch. After being let out of his kennel, Simon went over to Sammie, placed his paw on Sammie and offered him comfort. "The picture really speaks for itself. You can see Simon comforting Sammie. 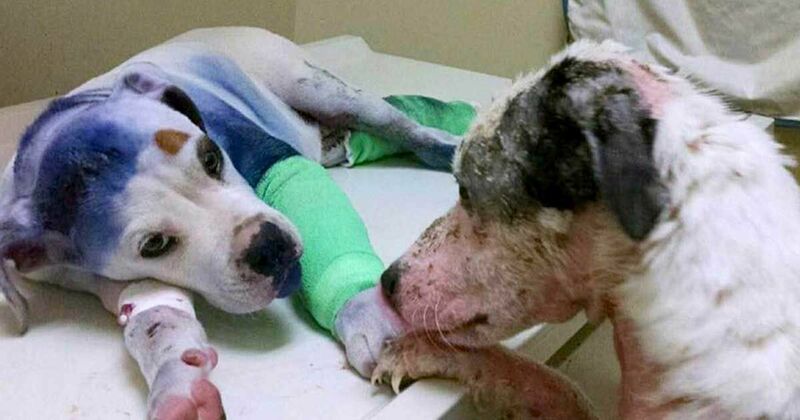 It shows that animals have compassion and they feel," Stacey Silverstein, of Rescue Dogs Rock NYC, told Today. During their time together at the Vet, the two dogs have become fast friends and often spend time playing together, according to Today. Sammie's story sparked a fundraising campaign which raised more than $27,000 to aid in his treatment. Last month, Sammie had surgery on her legs. The doctor was able to repair damage to her front leg. However, her back leg was missing 3/4 of the bone. Her leg may never fully recover, but doctors hope to save that leg too, according to 3 Million Dogs. Rescue Dogs Rock NYC want people to know that animals do have feelings. They do care. 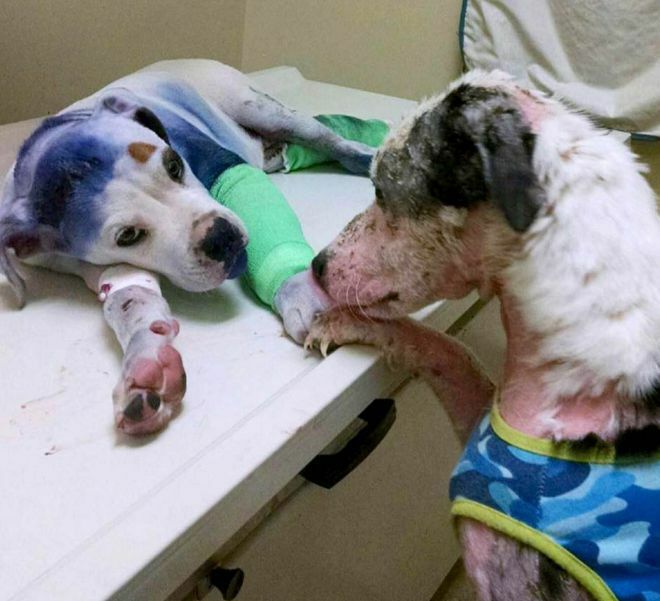 "[This is a] perfect example which shows us that our companion animals DO FEEL pain and show compassion for others ... Do not ever doubt the POWER of our beloved companion animals," they wrote on their Facebook page.